Click Here to Order Social Sheriff! FTC Legal Disclaimer: There is no level of product performance or success that can be inferred as typical, as all customers have a unique experience. Your results will vary, depending on the age of your account, your location, your IP address, number of Facebook™ friends, past Facebook™ usage patterns, language settings, and other factors. This product is in no way endorsed by or affiliated with Facebook™. This product currently works on Windows computers only. As with all software, there are certain risks you assume when using this product. There are no income promises expressed or implied through usage of this product. There is no guarantee that any sales will result from the leads and prospects that Social Sheriff finds for your business. As is typical with all marketing and advertising efforts, there is the risk you can lose money by advertising to prospects the software does find for you. By using this product, you understand and assume these risks. See our full FTC Legal Disclaimer for complete detail. 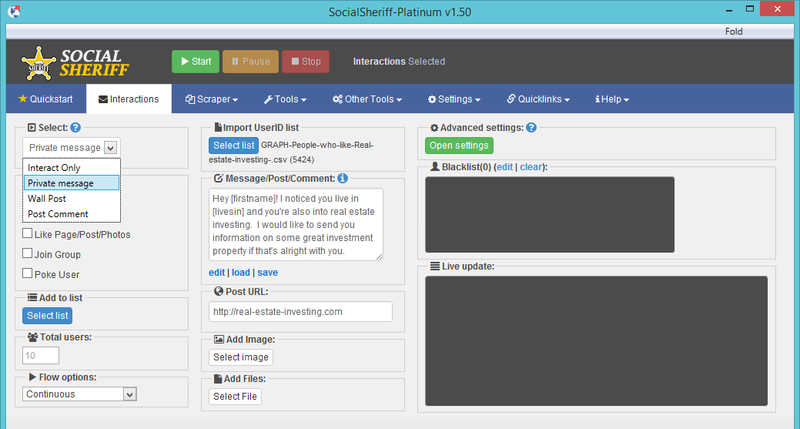 Do you have questions about Social Sheriff? Are you wondering if the program will work for you, or do you have questions about the risks? Give us a call! You can contact us at 1(832) 713-6283 or by any of the other methods on our contact page, and we'll be happy to help you out. With Social Sheriff, You Get These Amazing Benefits! Finds prospects in your niche based on keywords you specify. Manage one-to-one interactions on autopilot. Locates prospects and make direct contact with them through automated friend requests, inbox messages and replies. Finds people who like and comment on pages, photos, posts, and more. Foster relationships and get them in your funnel. Makes wall posts, sends and replies to inbox messages, and even sends happy birthday greetings on your behalf. 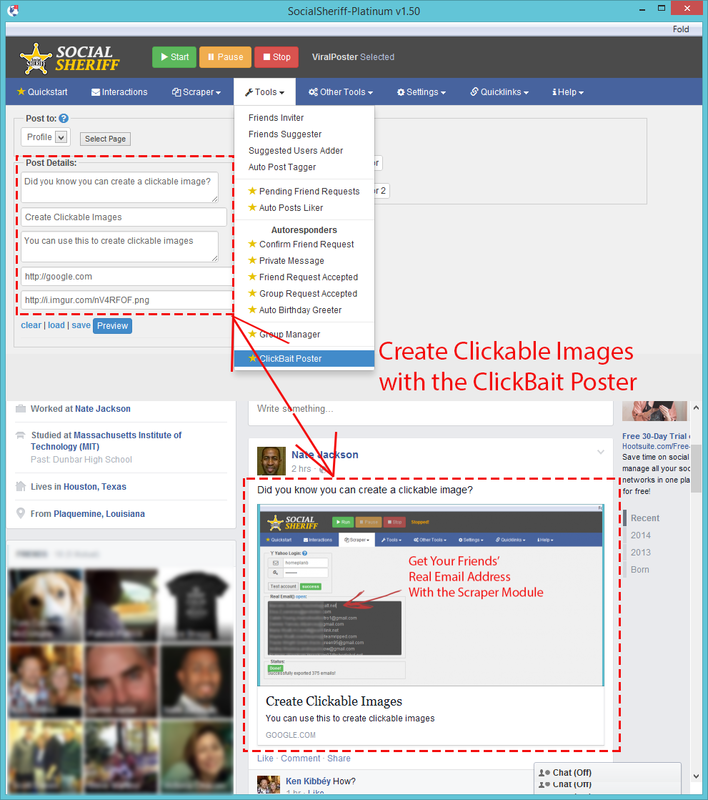 Finds relevant posts, photos, pages and videos in your niche and leaves likes and comments on your behalf. Expands your network by discovering common interests. Find content that holds their interest and join in the discussion. Variable delay times make your actions seem almost human. Inserts your prospects’ names into your inbox messages and wall posts. Set it to run at the same time each day to handle your daily tasks of adding and confirming friends, responding to product inquiries and much more. Set it to run around the clock for you and free your time. Spend less time on Facebook and more time doing what you love. Finds people, groups, pages, posts, photos, events, and videos about any keyword of your choice. Runs multiple graph searches at once and organizes results by topic. Uploads a list of users and sends them each inbox messages or wall posts. Customizes messages with FirstName, LastName, Hometown and Current City. Social Sheriff compiles a list of users who like, share and comment on any page, post, photo, or group and sends your message to the most active users. Expands your network and grow your friends list on autopilot. Social Sheriff invites friends that you find through graph search. It also adds suggested friends. Automatically replies to anyone who sends you a message with a keyword that you specify. Great for product inquiries or requests for more information. Automatically confirms friend requests. Sends a thank you note when accepted into group or when someone accepts your friend request. Sends birthday greetings. Automatically tags your friends in posts, comments, photos. Keeps your profile in front of your best prospects. Uploads a photo into your post and links it directly to your URL. Takes your users directly to your site. Prospects no longer have to click the photo then click the link. Want to build an email list of your friends? Now you can download the real email addresses of all your friends and share your marketing message with them. Interacts with profiles, pages, groups, and posts. Customize lists of people to interact with. Send private messages, post to walls, comment on posts. Add friend, follow users, like pages, join groups. Sort newly added friends into lists. Add dynamic user variables into messages, such as FirstName, LastName, Hometown. Post URLs and add images and files to messages. Smart tracking to prevent duplicate messages to the same user. Prevents messages from being sent to the ‘Other’ folder. Extract user IDs and Facebook email addresses. 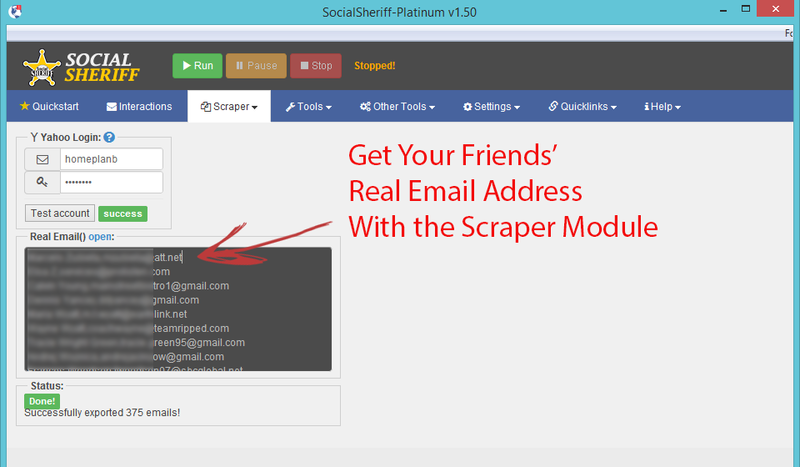 Extract the real login email address of your friends. Extract users who like, comment, or share on a fan page. Extract the friends of your friends. Organize your results by keyword or search phrase. Get your own account details: Your friends, pages you like, groups you joined. 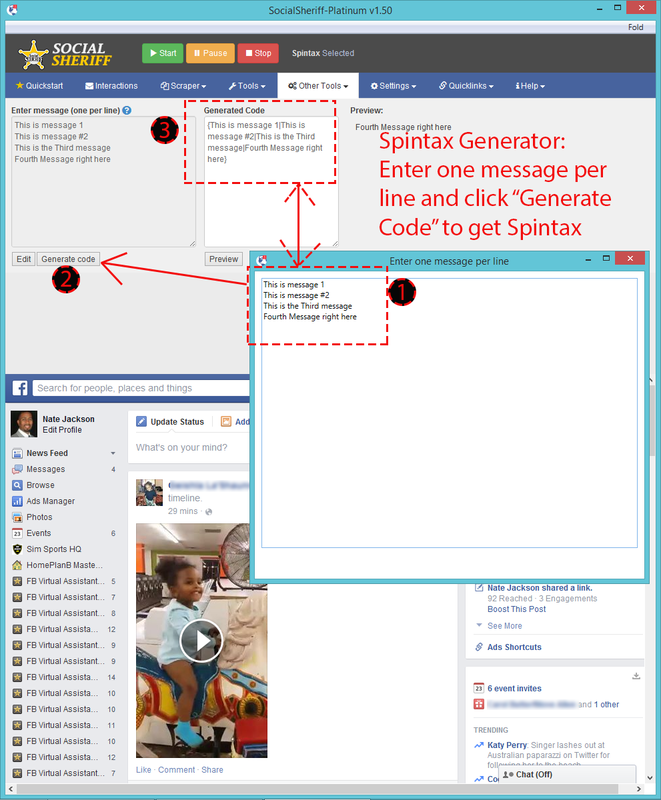 Spintax Generator Helps You Randomize Your Private Messages and Wall Posts. Buy Now and Get These Awesome Benefits! Current pricing is available for a limited time during launch. Once the price goes up it will never be this low again. Buy now and make your competitors pay more. If you have any questions about the software, I’ll spend 30 minutes on skype with you to help develop a gameplan. Just submit a ticket with my helpdesk to schedule. If Social Sheriff does not work on your computer we will do our best to troubleshoot it. If we can’t help you get it to function we’ll refund you within 7 days of purchase. 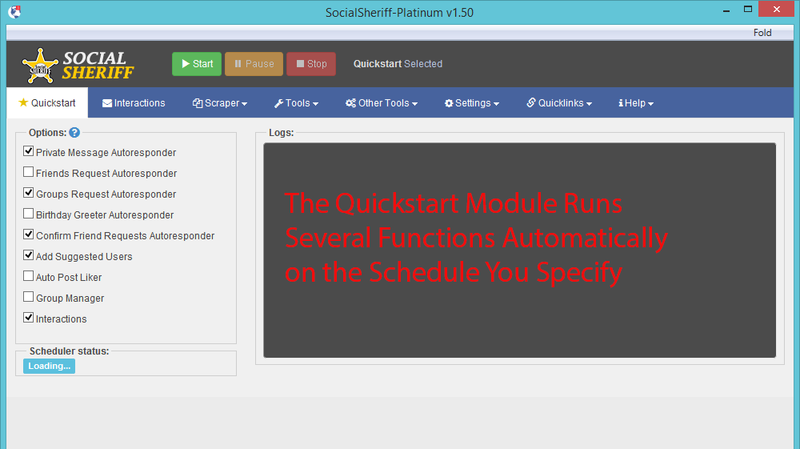 Guaranteed to Work or Your Money Back: If Social Sheriff does not work on your computer we will do our best to troubleshoot it. If we can’t help you get it to function we’ll refund you within 7 days of purchase.